Adenine riboswitch aptamer domain before binding of adenine (left) and with adenine (right). 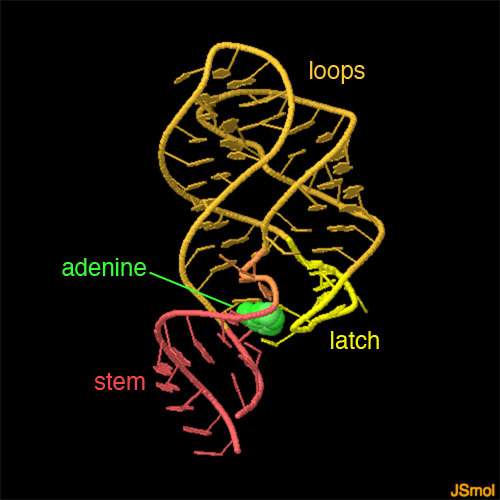 The “latch” region (yellow) undergoes a large change to accommodate binding of adenine, and the “stem” region (red) forms a stable double helix. Riboswitches are structurally dynamic RNA molecules, undergoing changes in shape as they perform their regulatory functions. Riboswitches typically have two domains: a ligand-binding “aptamer” domain that changes conformation when it binds to a specific ligand, which then sends a signal to an “expression platform” domain that regulates use of the RNA. Thus far, structures have been obtained for the aptamer domains, but the motions caused by ligand binding have been tricky to observe by crystallography: crystals typically freeze molecules in one shape, so crystallographic structures of unbound aptamers typically look very similar to the ligand-bound form. Researchers are using XFEL radiation sources in a clever way to help surmount this limitation and observe directly what happens when a ligand binds. Free electron lasers (FEL) provide very bright, but very short, pulses of X-rays. In XFEL experiments, a stream of very tiny crystals is flowed past the beam, and each time a crystal is caught in one of the pulses, it creates an instantaneous diffraction pattern that captures the molecules in the crystal at a defined moment of time. By collecting similar diffraction patterns from many crystals caught in random orientations by the X-ray beam, researchers build up a full diffraction data set. To capture the dynamics of molecules, researchers start a reaction and then collect diffraction patterns at a given time after the reaction starts. In studies of photoactive yellow protein, researchers flash the crystals with light and then watch what happens. For example, in the case of riboswitches, researchers add the specific signaling molecule, in this case, adenine. Two structures are shown here. The first shows the riboswitch without adenine (PDB entry 5e54). For the second, researchers mixed the crystals with adenine, waited 10 minutes, then gathered XFEL data. The adenine-bound form shows a large change in conformation that creates a stable double helix at the end of the riboswitch (PDB entry 5swe). Crystal lattice of the adenine riboswitch aptamer before binding of adenine (top) and with adenine (bottom). Biomolecular crystals often have large channels of solvent between the molecules, so ligands may be soaked into the crystal to explore their binding. Unfortunately changes this large are rarely observed by conventional crystallography because larger crystals are needed to collect data using synchotron X-ray sources, and the larger crystals often crack when the ligand binds. This study of riboswitches, however, demonstrates that the tiny crystals used for XFEL are able to rearrange to accommodate large molecular motions. The crystal lattices for the unbound and bound forms are shown here—notice that the large change in shape forces the aptamers to pack in an entirely different way. In this XFEL study, a structure was also captured 10 seconds after addition of adenine, revealing an intermediate state with adenine in the binding pocket, but before the stem and latch regions had a chance to rearrange into the stable bound conformation (PDB entry 5swd). You can explore all of these structures in the interactive JSMol using the button above the image. XFEL is a new technique, but there are already many structures in the PDB archive determined with the method. Try searching for “XFEL” to see some of them. Structures of dozens of different types of riboswitches have been determined—search for “riboswitch” to see them. CP Jones & AR Ferré-D’Amaré (2017) Long-range interactions in riboswitch control of gene expression. Annual Review of Biophysics 46, 455-481. 5e54, 5swd, 5swe. JR Stagno, Y Liu, YR Bhandari, CE Conrad, S Panja, M Swain, L Fan, G Nelson, C Li, DR Wendel, TA White, JD Coe, MO Wiedorn, J Knoska, D Oberthuer, RA Tuckey, P Yu, M Dyba, SG Tarasov, U Weierstall, TD Grant, CD Schwieters, J Zhang, AR Ferré-D’Amaré, P Fromme, DE Draper, M Liang, MS Hunter, S Boutet, K Tan, X Zuo, X Ji, A Barty, NA Zatsepin, H N Chapman, JCH Spence, SA Woodson & YX Wang (2017) Structures of riboswitch RNA reaction states by mix-and-inject XFEL serial crystallography. Nature 541, 242-246.